I really love how this one turned out! In case you haven't noticed, I even pulled out my hoarded 12x12 designer paper from The Greeting Farm. I used two different sets....In the Spotlight and Roll Call. Both the inside front and back covers have pockets on the page. 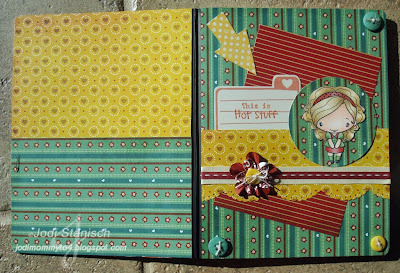 Catch the Bug - "Anything Goes"
The Sweet Stop - "Sketch"
Stamp Scrap & Doodle - "Anything Goes"
Aly's Sunday Challenge - "At least 2 DP and at least 2 buttons"
Stamptacular - "Layer it On"
Nutty Nutshells - "Use stripes"
Southern Girls - "4 layers of Patterned Paper"
Charisma Cardz - "Autumn Colors"
Crafty Sentiments - "Autumn Colors"
Moving Along with the Times - "Anything But a Card"
Inky Impressions - "Anything Goes"
Stampin for the Weekend - "Use the colors of autumn to inspire you"
Color Me Copic - "Coloring Clothes with Copics"
Wow! What a gorgeous notebook! So many lovely layers. Thanks for joining in our challenge over at Southern Girls. What a wonderful little notebook! Thanks for playing at The Sweet Stop! This is great! Awesome papers! Thanks for joining us at Crafty Sentiments. What a stylish notebook. Love all the layers. I hope the user will enjoy it for a longgggg time. Thanks for joining us at Cowgirl Sunday Challenge. This is fabulous Jodi! 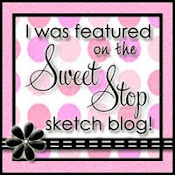 thanks for playing along at The Sweet Stop! This is one totally gorgeous notebook! WOW! Lovely papers too. Thanks for playing along with us at Southern Girls Challenges. Great job with your notebook! Great papers and image! Wow, this is so nice! I love the colors and all the details! Thanks for joining our fun at Stamptacular this week! This is so cute! thanks for joining us at Crafty Sentiments fall color challenge. Great project! Lots of fun detail! Love the colors. Thanks for playing along with us at Crafty Sentiments. 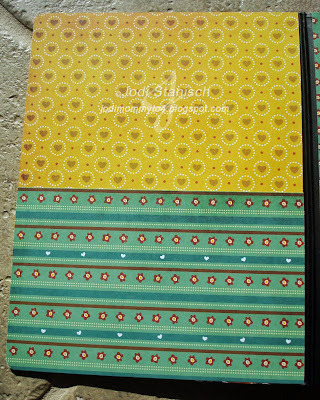 Love your notebook Jodi, great colours and papers. Thankyou for sharing this with us for the Anything Goes Challenge at MAWTT. This is just stunning!!!!!!!!!! What a fabulous notebook. I love the colors the papers, the design, everything. Thanks so much for sharing such a fabulous creation with us for our Layer It On Challenge at SSC. Great notebook! Those papers are beautiful! What a beautiful notebook! Thanks for joining us at For Fun Challenges this week! 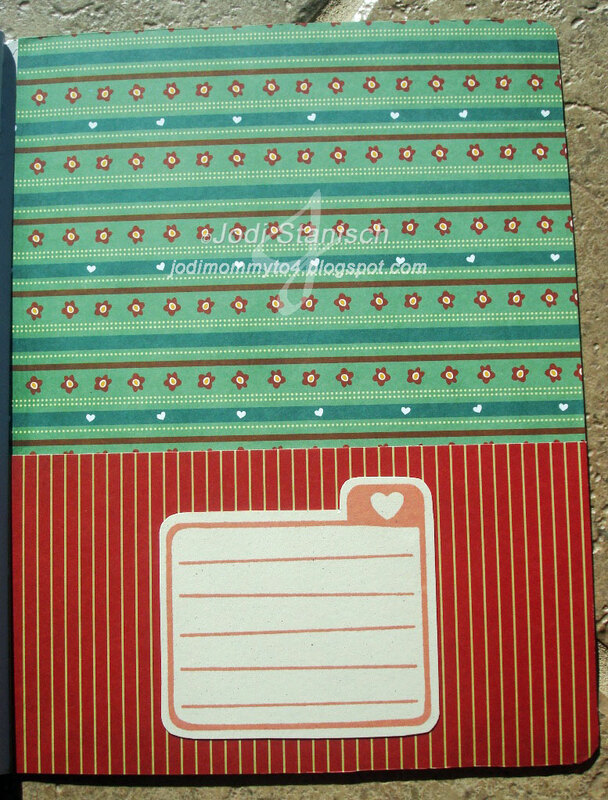 Fabulous notebook with great paper choices. 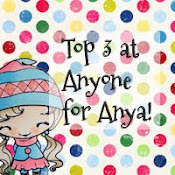 Thanks so much for joining in with the Crafty Cardmakers this week. 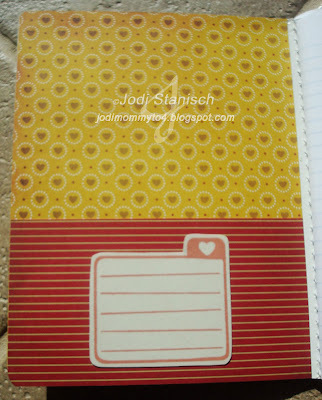 Great notebook, love your colour combo & image super cute!! Wow, this is fab, thanks for joining us atr Charisma. This came out so cute I love the notebook. Very pretty colors to. Awesome job. Thanks for joining us at Southern Girls, Good Luck. 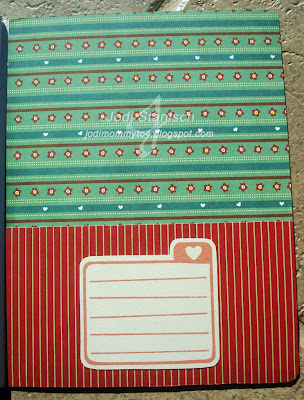 Beautiful notebook really stunning and such a great idea, lovely autumn colours! Wow great page. Thanks for the sweet comment on my card. Beautiful notebook and coloring. I'm so glad you entered it into our challenge at Southern Girls. Thank you! I hope you'll join us again for our next challenge. This is adorable Jody! Your coloring is beautiful. Thanks for playing along with our Circles Challenge at Penny's! Awesome notebook! I really love the paper...beautiful. Thanks so much for joining us at For Fun! I love the way your altered notebook turned out. Thanks for playing along with us at PKS! supercool papers! Thank you so much for joining the SFTW challenge and good luck! Great notebook and I love your colour scheme. How cute is this, I love it! Great job! Thanks for joining us at Southern Girls!